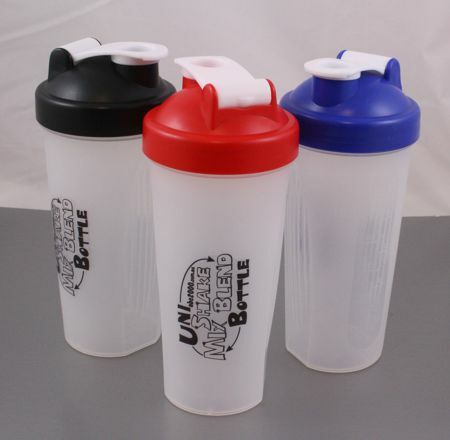 2 in 1 – The Best Mixing and Highest Quality Plastic Shaker on The Market. We are direct supplier / wholesaler to fitness industry in Australia. Mix your proteins / supplements / fruit juices / meal replacements / formulas in this special portable blender shaker bottle. Currently our Shaker Bottles are available in 3 cup colours: black, red & blue. Custom LOGO design print also available. 2 in 1 mixing systems:comes with steel spring ball & plastic mesh (use the one you like). Note: Never use steel wire mixing ball when plastic internal mesh screen is inserted into the container. Plastic mesh will get damaged when steel ball and plastic mesh is used at the same time. The shaker allows you to drink a smooth mix right from the bottle. This can be ideal if you are at work, office or at the gym, and don’t have access to a mixer or blender. Shaker Bottle has many other practical household uses as well. It can be used to mix perfectly smooth gravies and sauces or to prepare eggs to the exact consistency for omelets or scrambling. 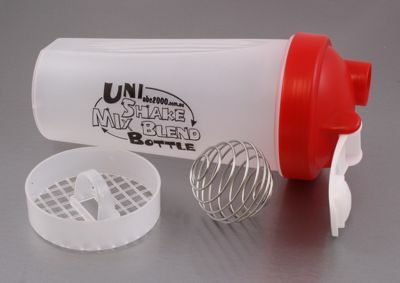 This Shaker Bottle is manufactured out of high quality plastic, it is both durable, practical & is dishwasher friendly. Use plastic mesh when quiet operation is required. Comes with internal screen & steel spring ball that breaks up any lumps or clumps in the mix. Avoid horrible ‘clumps’ of unmixed that aren’t very nice when mixing powder with just a fork or spoon. It has a large capacity and is calibrated with measurement unit markings in both metric up to 600ml and imperial up to 20 ounces measurements. Holds more than 600ml. of liquid. The use of these shakers is very simple. Place your scoop(s) of protein into the shaker, add your amount of water / milk, replace the lid tightly and shake up and down for around a minute. Then it is ready to drink. Make sure the top is secure though, it makes a mess if you shake it with a loose lid! These statements have not been approved by the Food and Drug Administration (FDA).